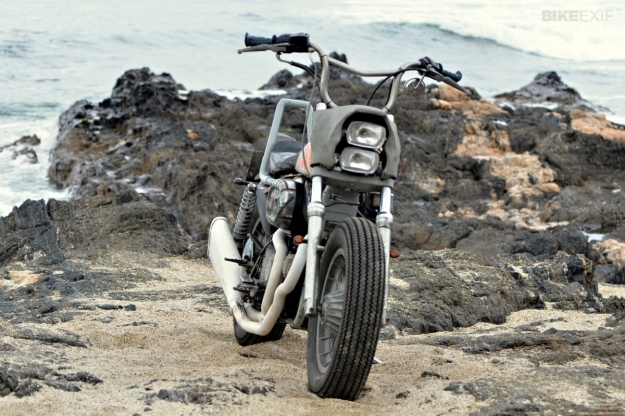 El Solitario is something of a phenomenon in the custom world. The Spanish workshop inspires both passion and rage from observers, and this latest build is likely to be no different. 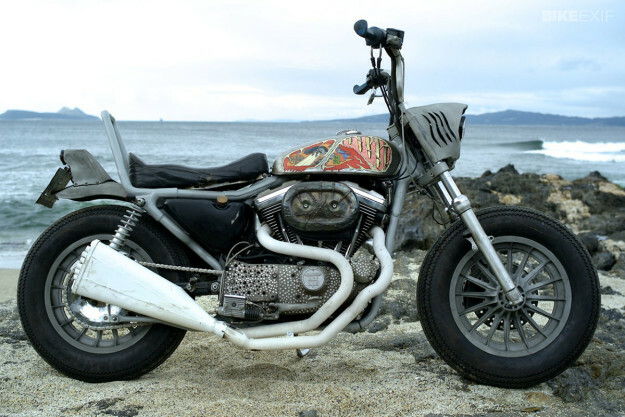 It’s called ‘Marrajo’—the Spanish word for a mako shark—and is based on a 1998 Harley Sportster 1200 Custom. The commission came from a client in in the Canary Islands, who wanted a bike with the off-kilter vibe of the Ducati 350 ‘Chupito‘, but suitable for long-distance cruising. The donor bike was super-tight, with only 10,000 miles on the clock, so the engine didn’t need any work. The ancillaries have been uprated though; there’s a Jagg oil cooler to keep the heat of the Canaries at bay, and a hand-fabricated exhaust system. Drive to the back wheel is chain rather than belt. The Galician mechanics saved their most intensive work for the frame and body. The shark theme extends from the custom nacelle at the front (housing twin Puch headlights) to the finned tail unit, finished in military-issue grey paint and sitting atop an old Bultaco rear fender. The stainless steel bars are from Front Street Cycle, fitted with Oakley grips and hooked up to custom triple trees, and mid foot controls with cast pegs improve the riding position. 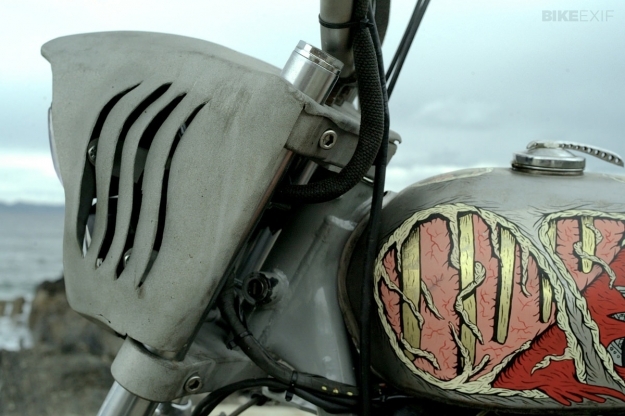 The rear part of the frame is all-new, and the tank is a vintage Ducati item painted by London artist Maxwell Paternoster, better known as Corpses From Hell. 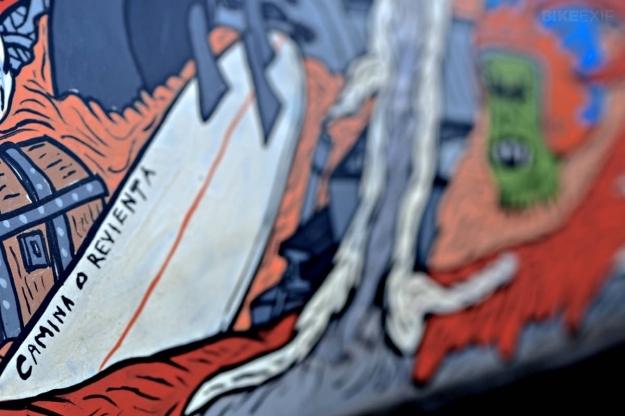 The inscription Camina o revienta (“Run for your life”) is a nod to a famed Spanish jail escapee, Eleuterio Sánchez. The suspension has been dropped a fraction—with modified NOS Japanese Redwing shocks—and the bike now rolls on 16” Shovelhead rims. Nissin calipers have boosted the braking at the back end. Other mods include a vintage Bates leather seat, a cast ignition cover from Chopper Dave’s, perforated engine cases, mini blinkers, and LEDs handling the lighting duties at the back. 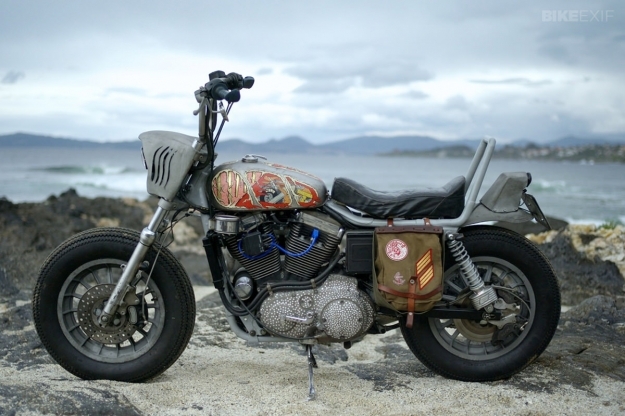 ‘Marrajo’ is a bike that swims against the tide in the custom world. I wonder how Los Isleños of the Canaries will take it? 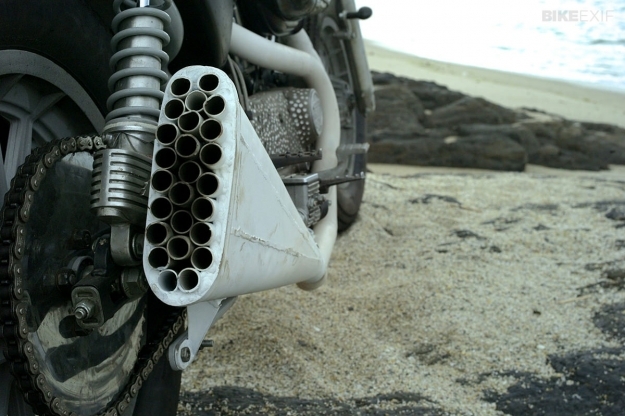 Follow the adventures of El Solitario via their website and Facebook page.